MikeKey wrote: I updated the first thread with new information on the communications. Please read it! Also, if folks could, we came up with a faster way to get everyones details for the coordinating our rally point and sending out text's. This way you're not in town, wondering WTF people are. Please, use the sign up form. Also, I already spammed a bunch of you with a PM. Cool sign up site, well done!!!! In your post you mention the Midland MXT105. It appears the MXT115 and MXT400 have some repeater functionality. I'm not good with advanced functions of civilian radios (anyone have a SINCGARS? Lol). Would that act as a mobile repeater for everyone's hand held devices? If someone ran a MXT115/400 with external antenna, etc., and stayed in the middle of the group? FYI, this is the "10th APWiM" (Annual Power Wagons in Moab) event. Dang, 10th! Ok, I was way wrong last year. LOL. Gotta get some stickers made possibly. DamageWagon wrote: Stickers? And t-shirts! Whose gonna pay for that? And design it? TankerZak wrote: In your post you mention the Midland MXT105. It appears the MXT115 and MXT400 have some repeater functionality. I'm not good with advanced functions of civilian radios (anyone have a SINCGARS? Lol). The repeater functionality of those radios is simply the capability to use a repeater offset. There would need to be an open GMRS repeater in Moab to take advantage of that feature, and it would likely be busier than the low power simplex channels. The radios do not act as a repeater themselves. A repeater listens on one frequency and re-transmits that audio out another frequency, this is called an offset because you listen on one freq, but when you PTT the radio switches over to the TX freq. I will look into GMRS repeater coverage in Moab since that could be beneficial, but that will require everyone that uses it to acquire the $65 GMRS license from the FCC, and of course the more expensive radio or more complex Baofeng configuration. I doubt it's suitable for official group comms but could still be a good resource to share, so I'll check it out. This is another advantage of ham, but most participants so far are not licensed. You can run a crossband repeater on a mobile radio mid-group to expand coverage. We could get everyone licensed by May, if there's interest! I think the people buying the shirts would pay for it? Design... Somebody have an artistic wife/daughter? yeah I don't know on that one. Whose designing the stickers? Hey everyone, told ya I'd take care of you. No standing around asking "What should we do today?". This year we'll have a ready list of trails. A few will be saved for when we have the most people in the group. Like Top of the World. Google this to see what an epic picture it offers at the top of the trail. General idea, is a list of 2 trails to choose from each day. I made a survey here: https://pwmoab.typeform.com/to/tnyC8x to get your opinion on MOST WANT TO DO trails. It'd be helpful if you are coming and gave me your feedback. DamageWagon wrote: Whose gonna pay for that? And design it? He specializes in combing logos and topo maps and designing things with an outdoors aesthetic, which would seem really appropriate for our event if you ask me. I'll have to hit him up. 4 - Trail consisting of loose rock, dirt, and sand with some slickrock surfaces. Some erosion; washes, gulches and rock steps no higher than 18”. Tall tires(33" plus) and limited slip would be a plus. 4WD is required. Enhanced suspension travel and good ground clearance are helpful. Good driving skills a plus. 5 - Trail surfaces are rutted, rocky and sandy with steps not exceeding 24”, with considerable slickrock surfaces. Water not exceeding 12” with some mud possible. 4WD, tall tires (33” plus) and traction adding devices (locker, limited slip) are required. Above average driving skills are desirable. A winch would be a plus. Enhanced suspension travel and good ground clearance are a plus. 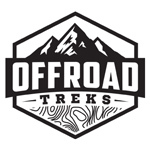 6 - Trails are difficult with considerable erosion damage, loose rocks, dirt, and slickrock. Water in excess of 12” is possible with mud conditions. Steps not exceeding 36”. 4WD, tall tires (33” plus) with two traction adding devices (lockers, limited slips) are required. A winch would be a plus. Enhanced suspension travel and good ground clearance are a plus. Excellent driving skills are recommended. 7 - Trail consists of rock, sand and considerable slickrock with many steps exceeding 48”. Steep inclines and declines are prevalent. Enhanced off road equipment is required including locking devices (front & rear), 35" tires, maximum vehicle ground clearance, and tow hooks. A winch is desirable. Excellent driving skills are required. Vehicle mechanical or body damage is likely. Roll over possibilities exist. Keep in mind, these ratings/requirements are made primarily with Jeeps in mind, we have some unique challenges (and advantages). Some of the trails did not have RR4W ratings so I included a link via Trails Offroad, which unfortunately requires a login but you can see the summary without. I don't want to clutter up this thread with responses, but I think this is the best place to gauge interest. Anyone interested in a multi-day group expedition after/before the main May 1-7 event? Thinking something like White Rim or Maze District, definitely open to other suggestions. If you're able to stay for a few extra days (or possibly before) and would want to join, PM me. If there's enough interest, I'll start another thread and we can discuss planning. Hopefully (with aearles help), I'll get HAM licensed before the trip! Started looking into it a little yesterday, then I ordered a bunch of accessories for my Rugged Radio today! (spent more on accessories than on the radio, lol!) Got a VHF/UHF magnetic external antenna, clip in radio mount, programming cord (to do the chirp mod to the radio), and a hand led speaker/mic, that way (hopefully) it's nice and convenient to use like my CB is. I have had the Rugged Radio for I guess a year or so now but have never used it, it just lives in the center console of my truck, crazy thing is- when I turned it on, it had dang near full charge from when I charged it up when I got it, that's impressive! I'm thinking I may have to buy a new tire (1) before the trip, as I don't think my Pitbulls will be in before the trip. I have my Nitto Trail Grapplers on the truck now, probably be at about 25% (F) tread and 45% (R) tread by the trip. (approximate) Although I rotate about every 5k, the rears get worn out fast due to driving style. (the rears got recently swapped to the front) So, thinking that if I get one new one, and put my (maybe 100 miles) spare with it on the same axle, should give me enough traction for "loose dirt" as one of the trail descriptions includes. A full new set would be better but, can't afford it when I've already got a set on order. Last edited by RAM4ROKS on Thu Mar 02, 2017 7:48 pm, edited 2 times in total. I like aa9pw.com for practice exams, though there's many others. Tune in and listen to some amateur repeaters, that'll get you familiar with protocol. Band plans ... hope you don't have too many of those questions on the exam. GMRS repeater .... build your own? UHF duplexer and a pair of old commercial UHF analog radios in a pelican case can get you a good long ways. Yeah, I definitely need to study, I have no clue about anything in terms of radios! "Extra" would be the right one to study for, correct? I think that is just the casual user? Ummm, I just clicked on the practice exam (on aa9pw.com) to get a general idea, this is going to be even more complicated than I thought. Talk of space station and satellite communications, you'd think they'd have a version for people that just want to talk to the other truck that's a ways down the trail, lol! Don't get me wrong, the stuff that you can apparently do with a HAM setup is awe inspiring but, it's just WAY WAY WAY out of the league of my end goal for getting a license which is just to legally communicate on this trip! EDIT: "Technician" is the beginners classification, I got mixed up some how on the listing of classifications. That's a HUGE relief!!!! Last edited by RAM4ROKS on Thu Mar 02, 2017 8:07 pm, edited 1 time in total. I'm taking the test later this month myself. A few of the groups that get together here in Idaho all run Ham. Seems to be real big with expo type guys. And it makes sense when you think about the reasons. Also, seeing about getting an actual logo, and I mean professionally designed by: https://www.instagram.com/topo.bear/ - so long as it's not $1000 bucks. Would there be any interest in t-shirts from anyone? MikeKey wrote: I'm taking the test later this month myself. A few of the groups that get together here in Idaho all run Ham. Seems to be real big with expo type guys. And it makes sense when you think about the reasons. Yeah, I definitely see why expo types would want to run HAM, the capabilities of the radios are absolutely insane!!!! I wonder if we can digitize a picture and simplify it for the purposes of printing? Some people here have great pictures of their wagons. That's what the DTX guys did, they took an action shot of a truck in the air and that got printed onto the shirts, but it's a regular short printing not like a photo picture. I like it. I'll see if I can find out where they did it. I would take two shirts, girlfriend might take one. DamageWagon wrote: I wonder if we can digitize a picture and simplify it for the purposes of printing? Some people here have great pictures of their wagons. That's what the DTX guys did, they took an action shot of a truck in the air and that got printed onto the shirts, but it's a regular short printing not like a photo picture. I like it. I'll see if I can find out where they did it. I would take two shirts, girlfriend might take one. That's a cool idea, there have been some extremely cool pics taken!!! Might be tough to decide 3rd gen vs 4th gen though, lol! Also, good call on a HAM thread, we don't want me to turn this Moab thread into "RAM4ROKS' stupid questions about HAMs" thread,any more than I have already, LOL! I don't think i can go this year but my GF totally surprised me anf said she would go. So probably next year m, when my back is more healed, we will drag the trailer down. If you guys need a T-shirt hook up i know a guy who has a company that makes t-shirts for softball teams and such. He might be able to do the production for you. I've also been following barlow adventures out of Moab. They run a jeep rental and offroad training facility in Moab. He has a power wagon (not sure if he's on this board) and apparently helped Ram with some of the marketing shots for the 2017. Someone should reach out to him. He might want to participate at least. Barlow is a chick, not a dude. Err, about the logo. I'm not dropping 1000. Sorry. I kind of expected it, since he's a pro. Oh well. She (Nena Barlow) said on the facebook group that she's out of town for training that week or she would have joined. We're up to 19 trucks confirmed! Still waiting on contact info from a few, if you haven't submitted yours (either pm or form), please check out the first post for the form. For those who are not staying in a hotel or have a shower, the community Pool and Rec Center in Moab proper offers access to their showers for a few dollars. No pass/registration needed, no time limit. Standard locker room style.